Perfect for a boy's room, girl's room or playroom, the Amish Oak Toy Chest provides an essential solid wood chest for organized toy collection. Get little ones in on the act with a big open solid wood chest to put their toys in. Amish made in America, this custom made toy chest is made of oak wood. Oak furniture is known to add warmth to any room and is a popular choice for fine furniture. With pinch free panels to protect little fingers and a perfectly balanced lid, great care is taken to provide the very best toy chest for your child. Amish made furniture offers a quality and attention to detail that can't be found in cheaper imitations. The corners of the Oak Toy Chest are rounded to prevent painful bumps on sharp edges. Select this chest to give as a gift. Brass plaque engraving is available to offer a special message for a dear child in your family. 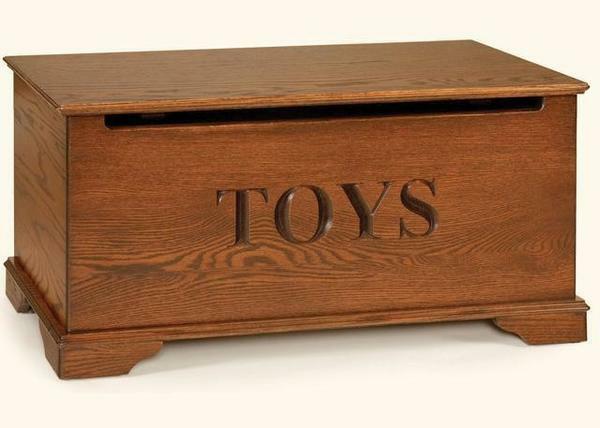 View more of our solid wood toy storage to find the chest you are looking for. This oak chest is built to be durable, safe and stylish. Call us today with any questions about our Amish furniture, or visit the DutchCrafters Furniture Store in Sarasota, Florida to experience Amish furniture in person.